Today I read an Associated Press article on Crain’s New York Business site about the Wall Street Journal overtaking USA Today as the top circulated newspaper in America. I thought the article was interesting and decided to Tweet it for others to see. ©Copyright 2009 Associated Press. All rights reserved. This material may not be published, broadcast, rewritten or redistributed. Does my Tweeting their article violate the terms of their copyright claim? Does Tweeting or Retweeting an Associated Press article constitute “broadcast” or “redistributed” material? Does adding a url shortening link to an article’s original page address qualify as being “rewritten”? If so, shouldn’t the Associated Press modify their copyright claim to include Tweet or ReTweet like my example below? ©Copyright 2009 Tim Cohn. All rights reserved. This material may not be published, broadcast, rewritten, redistributed, tweeted or retweeted. Or are Tweet related copyright claims unnecessary? I am not an IP attorney, however if you are an IP Attorney – feel free to tackle this question. Curious which Tweets the Twitter audience has re-tweeted the most? 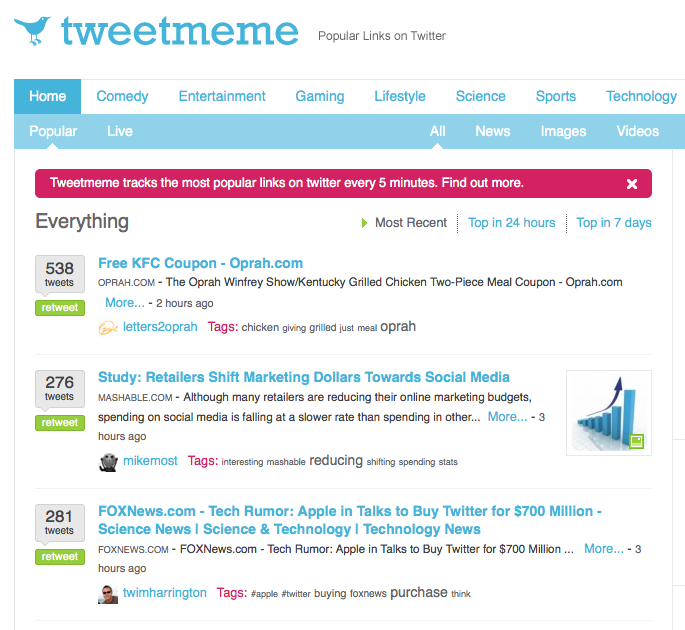 Tweetmeme aims to track and provide the most popular links generated on Twitter every five minutes. Tweetmeme lets visitors parse Tweets into lists of the “Most Recent”, “Top in 24 Hours” or “Top in 7 Days”. Tweetmeme provides insight into both the popularity and reach of Tweets within the Twitter audience.